For the purposes of this review, we are not going to sugarcoat the obvious -- the writers of Young Adult (YA) novels know exactly what they are doing. These authors come up with an idea and then realize that their target audience has most likely not been exposed to certain books, movies, and TV shows which are similar to that idea, so they run with it, creating a "new" story which has many overtones of older stories. Yes, it can be argued that nothing is original these days, but anyone over the age of 20 can't look at things like The Hunger Games or Divergent and think, "This seems very familiar." That should definitely be the reaction while watching The 5th Wave, an alien invasion thriller squarely aimed at younger viewers...or those with amnesia. The 5th Wave introduces us to Cassie Sullivan (Chloe Grace Moretz), a fairly normal teenaged girl who lives with her parents, Oliver (Ron Livingston) and Lisa (Maggie Siff), and her younger brother, Sam (Zackary Arthur). Cassie's life, and the life of everyone on Earth, suddenly changes when alien ships appear in the sky. These aliens, referred to as The Others, begin their invasion play by setting off an electro-magnetic pulse which wipes out all of the electricity. Next, a series of massive earthquakes create mass destruction and floods. This is followed by a plague (carried by birds), which decimates the population. The survivors, including Cassie's family, move to camps, where they are soon approached by the military who have news. The Others have landed and they can assume the appearance of normal humans. Humanities best bet is to have children fight The Others. When Sam is taking to an Army base for training, he becomes separated from Cassie, who must fight to find her brother while also learning of a way to stop The Others. I guarantee that a lot of viewers are going to watch The 5th Wave and their immediate thought will be, "Oh...this is Independence Day." (Keeping in mind that Independence Day was just a big-budget version of H.G. Wells' The War of the Worlds.) Yes, alien invasion movies have been around since the 1950s (when they abounded), but for a certain generation, when they show that shot of the mothership hanging in the sky, Independence Day is the first thing which comes to mind. And then we get scenes of tidal waves destroying landmarks, and we immediately think of...Independence Day (or any Roland Emmerich movie. That man loves destroying landmarks.) When the aliens come to Earth and we learn that they can look like anyone else, Invasion of the Body Snatchers or maybe The Puppet Masters come to mind. The second half of the film, in which Cassie is traversing the countryside, is reminiscent of every post-apocalyptic movies. 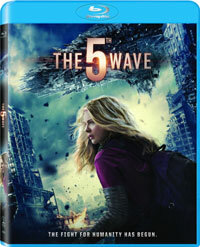 Obviously, the point is that there isn't much going on in The 5th Wave that we haven't already seen before. I haven't read the source novel by Rick Yancey, so I'm not sure how closely the movie follows it, but the film version certainly picks and chooses from many other familiar stories in order to put its tale together. The movie is further hampered by its somewhat bland tone. Maybe it's because I felt that I'd seen it all before, but I felt that The 5th Wave really dragged, especially in the middle. We see a lot of things happening, but most of it is not very engaging. I like Chloe Grace Moretz as an actress, but the movie works to hard to make her and "everygirl", and thus she comes across as very one-dimensional. (In the movie's defense, several early scenes which aimed at giving Cassie more depth were cut from the final product.) The second half of the film is a perfect demonstration of things which can work in a book, but don't really click in a movie. Once the children are taken for their military training, they are all given nicknames like Teacup, Dumbo, and Zombie. Hearing the characters call each other by these names comes across as silly. And it may sound like nitpicking, but the above issues ensure that The 5th Wave will wallow in mediocrity. In all fairness, the big twist is somewhat clever and makes the third act a bit more interesting. (This is one of those movies where I simply wasn't drawn in. If I had been, I would have seen the twist coming.) The special effects are well done, and the cast, which also includes Liev Schrieber and Maria Bello, is solid. But, if you have been exposed to any other alien invasion movie, you are going to find The 5th Wave to be an also-ran. But, it's tailor-made for 13 year old who wouldn't know Independence Day from Independence Day. The 5th Wave goes on the cheap by never showing any aliens on Blu-ray Disc courtesy of Sony Pictures Home Entertainment. The film has been letterboxed at 2.35:1 and the Disc contains an AVC 1080p HD transfer which runs at an average of 27 Mbps. The image is very sharp and clear, showing on overt grain and no defects from the source materials. The colors look very good and the image is never overly dark or bright. The level of detail is excellent, as we can make out textures on objects and the depth is very good. The Disc carries a DTS-HD Master Audio 5.1 track which runs at 48 kHz and an average of 2.5 Mbps. The track provides clear dialogue and sound effects. The action sequences produce impressive audio, most notably the plane crash and flooding sequence, as the subwoofer is palpable and the surround channels are filled with detailed sounds. We get some nice, subtle sounds from the front channels, which show good stereo separation. The 5th Wave Blu-ray Disc contains several extra features. We begin with an AUDIO COMMENTARY from Director J Blakeson and Chloe Grace Moretz. The Disc contains eleven DELETED SCENES which run about 25 minutes. One-third of these are from early in the film and feature more character development with Cassie and her friends. We then get more scenes with the child soldiers being trained. There is a 3-minute GAG REEL. "Inside The 5th Wave" (14 minutes) features a wealth of on-set footage, as well as interviews with many members of the creative team, Moretz and other members of the cast.. The piece looks at the story and themes, the visual effects, the location work, production design, and the stunts. "Training Squad 53" (5 minutes) takes us behind the scenes to see the military and weapons training the actors received. "The 5th Wave Survival Guide" (2 minutes) has various cast members passing along tips on how to survive an alien invasion. "Sammy on the Set" (7 minutes) profiles young actor Zackary Arthur as he interviews various crew members. "Creating a New World" (6 minutes) takes us inside the visual effects to see how very big and very subtle things were layered into the film.